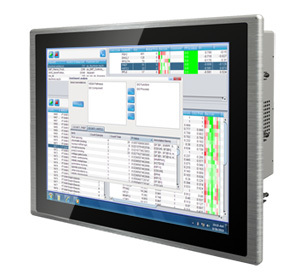 These Winmate P-Cap Panel Mount Panel PC products are available with various sizes. Depending on the application, users can select from 10.4-inch, 15-inch, 15.6-inch, 19-inch, or 21.5-inch Panel PC. Real flat display with an Aluminum enclosure, it is completely sealed system with Front IP65 protection against water and dust. These product series can be ordered with two designed motherboard using either Intel Atom N2600 dual core 1.6 GHz (only for 10.4-inch) or Intel Atom D2550 Dual Core 1.86 GHz (for 15-inch, 15.6-inch, 19-inch, and 21.5-inch). Winmate P-Cap Panel Mount PPC is a multi-touch solution with a high degree of accuracy, crystal clear resolution and exquisite design. Suitable for Industrial Control System, Home Automation, and Management System, Projected capacitive touch for the ultimate convenience and ease of use, allowing users to provide pleasant experience when using the device. It is also support finger movements or specific gesture like pinching (zoom-out), stretching (zoom-in) and swiping displayed data with the use of multi fingers.